Hey there! I just wanted to let you know how impressed I am with my pet door! I bought a large dog door. It was EXPENSIVE... and to be honest i was a bit hesitant. 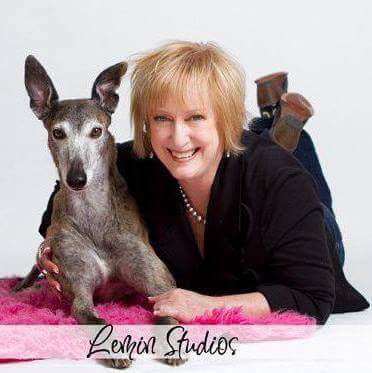 But I have had every "extreme weather" rated dog door on the market and without fail the soft flap freezes open leaving a huge snow drift in my kitchen and a frigid house, or the dogs smash through the stiff, cold door and break it right off! Usually on the coldest day of the year, of course. It regularly gets below -30C here in the winter months and I hoped that I would recoup the money on saved heating bills. I am so. Damn. Impressed. It was -48C last night. The door is a bit stiff but still able to be opened by the dogs. It is still making a tight seal. There are no drafts coming from the door whatsoever. If I put my hand on the door it's cold but nothing to write home about. I can't believe it!! Worth every penny and I will be trying to get every dog owner up here to invest in one. Thank you for your ingenuity! Just over four years now with two pet doors. One allows our 100lb dog access to the garage, the other allows him to access from the garage his fenced yard outside. We live in a high wind area. Temps range from greater than 100° in summer to the teens in the winter. These doors exceeded all our expectations. Never a moment's problem. The doors do not open with the wind and appear to provide decent insulation. They were relatively expensive, but well worth the expense. We'd buy them again, but it appears we may never need to. I cannot tell you how amazing your product has been working for us, the day that the door came to us in the mail our cold snap got even colder and the temps dipped down to -55 and the Home Depot dog door we had installed broke. The dual plastic flaps that made up its "seal" snapped from the cold, if not for you guys and shipping the door to us as fast as you did we would have been in some serious trouble. Our hot water tank boiler and water lines all are located in our garage where the faulty dog door is located, upon installation of your door our garage has been able to maintain its temperature with ease and gave us piece of mind for when we leave on our trip this Friday thank you so much again for your awesome customer service and outstanding product!! I am so pleased with the Freedom Pet Pass Door. I had tried to find a door that my 7 lb. min-dachshund needed to replace a damaged door. Locally I could find nothing to fit into my storm door—all were thicker than my door by 1/4". After reading reviews online, I contacted the Freedom Pet Pass company who offered to solve my problem with a custom door at no added expense. I received it the next week and has now had it installed. Graysie (the mini) is still getting use to the heavier flap but is making progress. As January cold set in, the room is warmer with the superior insulated dog door and a stronger magnetic seal. Many thanks for the cooperation of Freedom Pet Pass to solve my problem and gratitude to their customer service! As a note, Freedom Pet Pass will customize door-mounted doors to accommodate different door thicknesses. Stock doors are 1-3/4'' (44 mm), which is North American standard. I’ve had MANY different types of dog doors over the years that just didn’t make the cut. 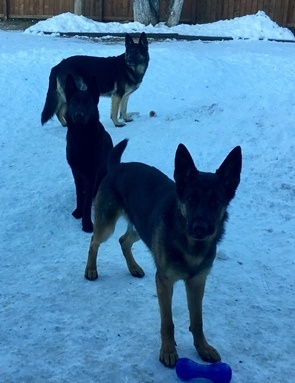 Having 3 high energy German Shepherds. I had emailed back and forth with Don, who guaranteed this door would work for us. It took awhile for me to put out the money for this door, but it was so worth it. After receiving out Pet Freedom dog door a few months ago, we had thought the outside flap had broken away from the dog door, we were wrong! After contacting Don, he told us it is a safety feature incase they get caught up in the door. He explained that you just had to pop out the plug and put that piece back in and tighten a screw. I was so happy that we’ve finally found a door that my dogs haven’t been able to break. We live in a small town that is the highest point in Alberta, East of the Rockies. The winds here, as well as the snow can be crazy. The door lets in no wind, or snow. It withstands our dogs running (yes, running) in and out of it many times a day. We spend a lot of time in our garage and have decided that come summer when we can take out garage door off, we’ll be getting another Pet Freedom door for our garage so our dogs can come and go in there as well as the house. If you’re looking for a dog door that can withstand weather and high energy dogs, this is the door for you! I have had mine for almost seven years now, and my dog is very active. I have had zero problems with this door and it keeps all the heat and cold out. It is worth the price you pay for it. I have had this dog door installed for about a month now and I couldn't be more impressed. The build quality is exceptional. I have had PetSafe doggie doors before, both standard and extreme and this one is on a completely different level. I know it's expensive at $300, but it is well worth it based on build quality, looks, and most importantly the seal. My dog door faces due north. This weekend brought weather in the 10's-20's with winds over 30mph and standing on the inside of the door there wasn't a draft. The PetSafe Extreme doggie door that I had previously would flap in the breeze with winds like that, but this one's magnets held it completely tight with not a bit of a draft. I was so impressed. The only thing that takes some getting used to is the snap of the magnets when my dogs go out the door. It is a sharp snap, not the sound of flapping plastic, due to the way it closes. That is completely acceptable from me due to the fantastic seal. If you have any concerns with energy efficiency of your pet door or drafts from wind blowing in, buy this door. It is well worth the money. This doggie door even looks professionally done and well built. It doesn't look like a cheap piece of plastic stuffed in a hole cut in your door. It looks intentionally put together, and the smoked plexiglass for a door lock insert is a very nice touch. I will update this review if the thing doesn't last (I've only used it for a month with two 25lb. dogs), but I firmly expect it to last for years based on the build quality that I can see. Easy for my two small dogs to use. The flap has a strong magnetic pull. My carpenter installed it with a beautiful frame. We are very happy with it. When we moved our dogs into their new home 5 years ago, we knew that a dog door was going to be high on the priority list of changes to make upon move in. We did a lot of research on the best door in terms of efficiency, size, and quality, and The Freedom Pet Pass checked all of the boxes. The price was a bit of a cringe point, but it ended up paying for itself in durability over the years. 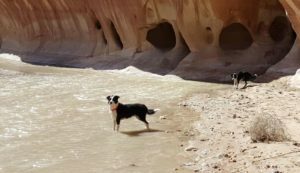 Our three 60-75 pound dogs went in and out numerous times daily in weather ranging from single to triple digits, and rolled with the punches without fail. After 5 years there was some noticeable wear (cracking on leather & magnet strip) on the outside, but it didn't impair the function of the flap, and we didn't have to buy a single replacement during that time. We recently moved, and some soapy water and a razor blade cleaned off all of the wet nose buildup to bring it back to looking good-as-new. Before the move to the new house, we purchased another FPP door to be ready. We accidentally purchased the in-wall option instead of the in-door version, but FPP was very good about accepting our return and refunding the purchase. Superior quality, durability, and customer service make these doors a HIGH RECOMMEND! Just want to say that you make awesome, weather tight dog doors. I live in Alaska and we get some strong wind and the door performs well. This is the one you want! Had a cheaper door, fixed it many times and was tired of it. Spend the money, buy this door and forget about it. The only thing I have done in two years is clean it and it is still good as new. Upstate NY weather. One dog in and out 4+ times a day. Great dog door! It has held up for many years! We purchased this dog door in 2012, and it has been in use continuously since then. My husband installed it himself easily, by cutting a hole in the lower part of a door leading out to the back yard, and following the excellent installation instructions. It took some convincing for my husband to agree to it at all, as he was convinced that any dog door would have air leakage and lead to higher electric bills. I did a lot of research and found that this door addressed those concerns and was highly rated. He has since admitted that his fears were completely unfounded. It is truly weather and air tight and we have seen no leakage at all. It is extremely well-built and sturdy and has not deteriorated in any way. The only maintenance that is needed is an occasional wipe-down with a spray cleaner and some paper towels. Most importantly, the dogs have no trouble using it. We had two 35-pound dogs when we first got it, and they got the hang of it almost immediately. It was wonderful not to have to constantly get up to let them out. Those two senior dogs have since sadly passed, and we got a new puppy last year who also took to it right away. 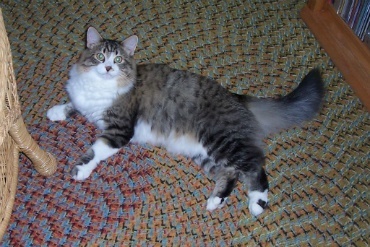 He is now a year old and weighs about 20 pounds. Our son’s 30-pound dog also uses it when he visits. We recently misplaced the pin that locks the acrylic panel in place, (used for when you want to temporarily stop access to the door) and I emailed the company to ask if I could purchase one. They emailed right back and were kind enough to send me one for free! So great customer service as well! The dog door has held up beautifully for many years and the company is a pleasure to deal with. I heartily recommend this product! Access Magnetics are great to work with and the closed pet doors are no colder than our very-well-insulated walls during our VERY frigid winter weather which is amazing! These pet doors are well-built, like good-quality windows, and seal up so much better than normal dog doors which are pneumonia holes. Our dog doors came out very nice. (Not sure if I ever sent photos.) We had them trimmed out to match the rest of the house. On the outside of the upper level door, we made some temporary steps out of concrete block. (Dear Husband is planning to build nice steps later that will match our Trex decking.) We found the placement/removal of the locking pane a bit awkward at first, but now it is quite easy - such a great design! Upstairs the pane fits perfectly behind my pot rack. On the lower level DH put up two L brackets so we could hang the pane on the wall when it is out. She is SO smart and has the very best temperament. The breeder has several little children and made sure the pups were well-handled as he went through the "super-puppy" regiment with them daily for their first eight weeks. 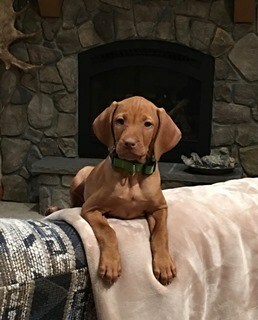 Kati is by far the best Vizsla we have had. 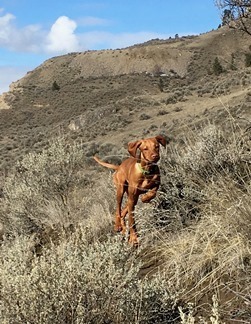 All Vizslas are high-strung but she is much more resilient and accepting than our others have been. It doesn't even faze her to be left home alone for several hours. The instructor at our puppy class said Kati would not learn to use the dog doors until summer. Ha Ha. She was dashing in and out by March. She is a VERY active dog and goes through her two dog doors dozens of times every day. She likes to run "zoomers" as fast as she can down the interior stairs, down the hall, through the lower-level dog door, round the yard, up the hill and through the upper-level dog door, often with a stuffy or other toy in her mouth, over and over. She is very fast and very agile as you can see from this photo on one of our morning hikes behind the house. I worried that the solid door might be a problem. How could she tell if we had it locked shut or not? As it turns out, it has not been a problem at all. We have a routine. Both doors are locked up at night so she has to use the people door if she needs a midnight potty stop. In the morning we open the upper door and it is usually open all day. The lower door is open if we are where we can keep an eye on things as it is much more accessible to visitors. Consequently, if Kati wants to go through at a time that she suspects a door may be locked she batts at it to check before barreling through. If she has just come through and knows it is open, she blasts through in a blur. Hope your company continues to do well. It is so good that finally SOMEONE is making good quality dog doors. 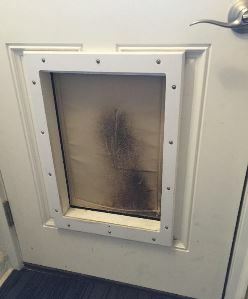 We have been using your doubl-mag dog door for close to 12 years, first years were in MN, where temps would get to -20F several times in winter. No leakage that we could detect. We are now in UT, not nearly as cold, but the door performs great and has given us great service over the years. One anecdote you may be interested in, we left our escape artist dog in the house once for several hours with the door locking panel in place. The dog figured out how to remove the key at the top (!! ), then she must have pulled on the knob hard enough to remove the panel to get outside! This is the only report we've ever received about a pet getting out with the locking panel in place. That is one clever dog! I have had this door for two years now and it has worked great. It is located in the garage leading to the outside. We live in South Dakota and we do not have any cold air coming into the garage through the dog door. We also have a different dog door in a door leading into the house. I absolutely love my new dog door! I feel like my dogs are more secure on their dog porch. And heating and cooling their enclosed porch will be so much more efficient. My contractor had no problem installing the door. It fit perfectly between the support joists. Wish I would have known about this door eight years ago. I can breathe easier knowing my dogs are secure and comfortable! I am now the proud owner of FOUR of your pet doors! They are worth every penny! This last one I bought has a bit of a backstory - I agreed to take in 5 rescue kitties from a hoarding situation. These five cats were to be barn cats eventually, but I got them the end of October and it was entirely too cold to let them out and expect them to find their way / survive in their brand new home. So I set them up in a back bedroom until spring. These 5 half-feral "barn cats" turned into 5 of the biggest love bugs you ever saw! There was no way I was kicking them out to the barn. So I bought another one of your cat doors and hired a contractor to install the door into the open bedroom window complete with a tiny outdoor deck for them to access this new door. Here is the newest one from inside a back bedroom. I have to wait for the wood to dry out a bit to paint it. Thank you so very much! These doors are the best, wish we had done this years ago. 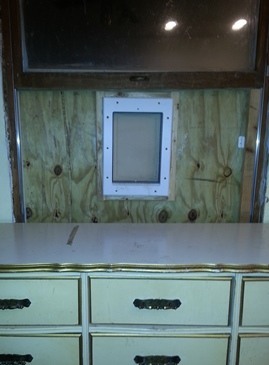 We previously used a cheap slider dog door, it was so cold and the flap would look gross and tear after so many uses. We love your doors and have had two of them in our house for 8-10 years. One goes from the house to the garage and the one that was damaged goes from the garage outside. They are as good as the day we purchased (except for what the visiting dog did to the outside one). Thank you for having replacement parts available for such an old door! We would be honored if you used our comments about your pet doors for a testimonial. They have been very dependable for us. Thank You for a great product. We have a commitment to always stocking replacement parts for every door we've ever made. Our doors are made to be repaired if damaged, not replaced. I purchased an extra large wall mount door from you last fall for my Alaskan Malamute. I would just like to let you know how happy I am with the freedom pet pass door. I was hesitant at first because of the price. (I had originally bought a different cheaper door that I could see right away would not keep out the draft, and fortunately returned it without ever installing it). We had a colder than usual Winter even for northern Canada and there was no problem with the door, even during extended periods of 20 below and colder. The flap seals perfectly no matter what temperature, my dog figured out to use it within a couple of days and after two weeks even my rather small cat had no problem using the XL door. The installation of the wall mount door requires a bit of time and skill, I am a carpenter, so it was no problem, if you are not handy with tools, you might want to get some help. Customer service is excellent, I got immediate answers to every email. My pets and I are very happy with this door. I received my xl dog door to replace an "extreme weather" dual flap door. There is no comparison. The other pet door let in so much cold air and if the wind even blew 10 mph it would open the flaps. I have not had too much wind blowing directly on this one yet but it seems airtight without even putting the caulking on it yet. Love the fact that is built in the USA also. I have had a lot of questions about it and the customer service is great. I think I have found the only pet door I will ever buy. Thanks for your wonderful product. Best door you could ever buy. Still works perfectly ( going on 4 years) and seals out tremendous Midwest cold and snow every time. A good investment! Amazingly effective at keeping out the cold. I don’t normally write reviews, but this product was so exceptional, I felt I had to. The difference between this door and my old ones is astounding. It really does insulate and seal the door. I no longer have huge gusts of cold air blowing through my house! You can put your hand right in front of it and there’s no cold air coming it. A+ in my book! Save you money. Do not buy. Was under the impression it would not open in the wind. It is windy at our home right now and I have had to close off the door since the flap is wide open. Could have spent a lot less for the same quality. We bought the extra large and it was a wall mount. So now we have a huge hole in the house and an expensive dog door that lets in cold and wind. Would never recommend to anyone. Save your money and go get a cheaper version. This person unfortunately never contacted us, nor did he or she leave any information on their Amazon review to help us get in contact. The performance this customer experienced is unacceptable, and he or she had a right to be mad. If this customer would've contacted us, we would have absolutely made this right. I have installed your XL door and it's performing as expected. My dog uses it all the time. We are at the end of our second week of daytime temperatures being as high as -15 C, and as low as -33 C. This week the warmest it got was -20 C. We've had a lot of snow and strong winds (30 - 50 km/h with gusts up to 70 km/h), and a couple of days of the wind and snow blowing directly at the door. There's sometimes snow that falls off my dog as he comes through. There's no way to stop that, but that's the only flaw there is. Our new pet door has been perfect thus far! We have had this now for 6 months now. So I thought it was time to do a quick review. This replaced a petsafe basic rubber flap door. I'm very impressed with it. The biggest improvement is that it seals extremely well. I no longer feel a draft coming from the dog door and the laundry room is no longer cold. Also, it feels like it's going to last a while. We have 2 dogs that run through the dog door. With the old petsafe door, the flaps would start falling apart after 6 to 9 months. This shows no signs of damage so far. Also, the dogs didn't have any issues transitioning to the new door. The only area for improvement would be to make the security insert stronger. It's just a piece of plastic, which feels like it would be easy to break through. Not a big concern for me, but I know that's important to some. Regarding the security panel - it is made out of 1/4'' acrylic, same material used in some grades of bulletproof glass. When locked, the pet door is roughly as secure as a locked window. Last week, in temperatures at the freezing level, we installed the Freedom Pet Pass extra-large dog door, manufactured by Access Magnetics in Bay city, Michigan. The company was very attentive to providing shipping details, and followed up to confirm receipt. The packaging was very good, and the courier delivery was exactly on time. The door assembly is very solid and substantial compared to others on the market, and very professionally manufactured. The instructions were clear and easy to follow, and the correct bit was included with the six colour-matched securing screws. Installation was remarkably easy, especially as we chose a wall is not insulated. We needed to remove a length of a 2x6 framing stud (it was between two others on standard spacing) and nail in a header, then cut the opening to size through the board and batten exterior. The door assembly slipped into place easily, and securing it to the frame with the screws is a quick job. We've had large guardian dogs on the farm for 20 years and have used several approaches to dog doors, with varying degrees of failure. Pre-fab commercial storm doors with built-in plastic pet doors are too flimsy for large dogs, not large enough, and not thermally efficient. Our DIY efforts have been sturdy but even less efficient, and they certainly have a home-made appearance. We think the Freedom Pet Pass is the best solution we've seen. The double-action design is brilliantly simple and made possible by robust flap material secured with a magnetic closure system that creates a good seal; no drafts detected in strong (and cold!) gusting winds this week. And it looks great: the dark green colour we specified complements the wall colour very well. We did the installation the day before the first real snowfall of the season and much colder temperatures, and we'll wait until spring to do exterior custom trim (and a fresh coat of paint on the wall). We're looking forward to getting the dogs installed in their winter quarters when it warms up in a few days. We think they'll like it as much as we do. We'll get some photos if they don't come bounding out too quickly. We are very grateful to have won this door in the draw. We have never before seen such a well-designed and constructed pet door. It's a great solution to a frustrating problem. We have 15 cats that use the door – all have adjusted even our calico that only has one eye and that eye has a scar – she doesn’t like new things since she can’t see very well. Freedom Pet Pass is the ONLY doggie door you should consider. I had many doggie doors before and got tired of the inefficiency (wind, rain, not a good seal etc.) and lack of durability. My first Freedom Pet Pass Door lasted 7 years. The only reason I have not had it longer is because I moved. It was still in excellent working order when I left. I just placed my order for my second one for my new home. Go the distance and select Freedom Pet Pass. You will be pleased. This company goes above and beyond in customer service. If you're going to get a dog door, I encourage you to invest in this one. We bought this three years ago. I hesitated at the price, but it's a true investment. It still looks great and functions perfectly. The energy efficiency is amazing. There is no comparison between this and the cheaper one we had before. It is absolutely superb. Just buy it. So worth it. This dog door definitely keeps the cold out. No drafts, gaps, or blowing open in heavy winds. It is a solid (opaque, not clear) canvas (?) flap, so if your dog has not used a dog door previously it could take some training. My two dogs had no issues using this door when we put it in my new house after years of the translucent flap petsafe door. It does make a loud clicking noise when they go in or put that some pets may not like. Despite the strong seal on this door, it seems to be easy enough for a smaller pet to use. My little dog is about 12 lbs, Jack Russell/chihuahua, and she flies in and out all day long. If you're not very handy have this installed. Not an easy project. But even with paying for install this dog door is totally worth it. We are very happy with our new door's performance. It is as good as advertised, and you know how often that happens. 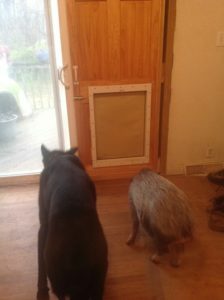 I thought that there might be a problem with the fact that the dogs could not see through it like the old door, but because this is in a patio door, they've learned to look out through the glass first. The room where it is installed is no longer an icebox at night. Yay! Thanks for a great product. Worth every dime. This is a terrific dog door! It looks good and works very well. Our dog had no trouble getting used to it. I used to chew when I was a baby but now that I’m all grown up my mom got me a replacement door and she installed it all by herself in ten minutes. My new door is fresh and clean and I would never chew it! Thanks for making it so easy and and so fast! I showed my brother and sister how to use it and they got the hang of it in just one day. They promise not to chew it. It is worth the price!! Wow, this is the best doggy door ever! 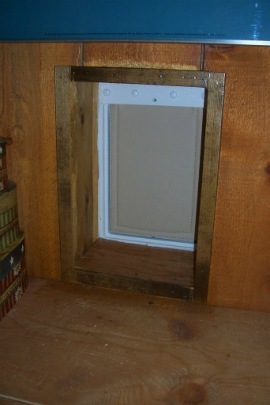 We had a regular (read cheaply made) doggy door in our old home. We recently moved into a new home and we wanted something nicer. My husband compared doggy doors for days and days at site after site. He came to me with this one and I must admit I was taken aback by the price. I gave in and we ordered it and I am SO glad I listened to my hubby. This door is awesome. There is no air blowing through ever even during a big thunderstorm. You can not feel a draft of any kind. Our Brandy goes in and out like a boss. It makes a noise clicking back shut but she is not a bit put off by it. And I got used to it quickly, knowing that sound was it shutting very firmly which is a good thing. Quality not worth the price. I've put these doors in two of my homes now. The first one held up fine with heavy use by a doodle and a lab, I was happy with the air sealing performance with that one as well. The second that we bought quickly fell apart. Within months the outdoor seal became loose and has since come off. We haven't contacted the company to resolve it, they maybe would, but for the price I expect more than a few months of use, we are shopping for a replacement now. This review was originally posted on Amazon, and we did not see it until 2019. That is our fault for not being more alert to help this customer. It is unfortunate that they didn't contact us, as we would have fixed their issue quickly and permanently. I appreciate you working with me, and not trying to make another buck by just telling me I need to get a new door. I've had doggie doors since 1990, and out in the country where there can be blustery winds and rains, I have been able to count on this door. That means a lot. I absolutely love my dogie door. I had it put in when I had my addition put on. The dogs are using it easily. I love the look and it is very secure. Haven't gone thru a winter with it yet but I don't see that there will be any problems...except messy paws but that's ok too. Our Border Collie is so happy to have her own door now. We are very pleased with this pet door. Best Doggie Door Available - Look No Further. By far THE BEST doggie door out there. I live in Colorado where it gets as low as -20 in the winter and this doggie door keeps 100% of the cold out. Also, does not open with high winds or rain yet dogs can freely come and go. 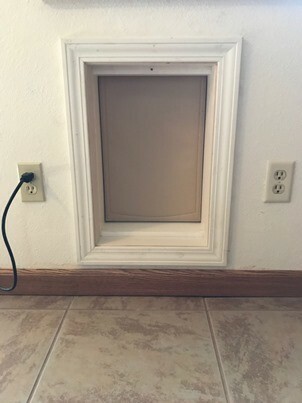 I did ALOT of searching for the perfect doggie door and this is it. Yes, it is expensive, but it is THE BEST! I was deleting old emails and came across one from you in Jan 2015 asking if everything was OK with my dog door which prompted to let you know that it is still working perfectly and has coped with everthing that the east winds in Norfolk have thown at it. It is still completely air-tight and looking good. Best of all my kitchen is never cold in winter, wind-blown rain no seeps in and I don't have to build a make-shift wall in front of my back door to prevent the wind from constantly opening the dog door! I have never found a product as perfect as yours - easy to install and working so well over 2 years later. Thank you for inventing this wonderful pet door! I had the pet door installed last year and am very please with it's performance. I like the amount of insulation it provides and the magnet hold really well. I have used other pet door before; but this is the best one so far. Thank you for creating a wonderful product. Great door, but still lets the cold in. This is a pretty great product, but is not as weatherproof as advertised. During the winter, you could feel that the floor near the dog door was freezing (even after it hadn't been used for hours) . Other than that, it works perfectly. Unfortunately, this customer never contacted us, and the name on Amazon doesn't correspond to any in our sales records. This issue is likely due to incomplete weather sealing during installation. We just installed this as a replacement to a PetSafe dog door and the improvement is amazing. There is NO DRAFT even though we live in a very windy and cold area. I don't know why we waited so long to get this dog door. It's worth every penny. Plus, we initially ordered the version to install into a door but then changed our minds and exchanged the door version for the version you install in a wall. Freedom Pet Pass made the exchange easy and they didn't even charge for additional shipping - even though it would have been reasonable for them to do so. What a great experience and a great company. We purchased this door in Nov 2016 and within 5 months, it has started to fall apart. We are in Colorado and the winters are as you would expect them...somewhat snowy and cold. This winter was no exception. You can see in the photo that part of the flap is just hangin there. It seems like poor workmanship as far as I can see and I am not particularly jazzed about shelling out another $300+ for a new door. Unfortunately, this Amazon buyer never contacted us or left us a way to contact him or her. We could have helped with a simple, permanent fix. 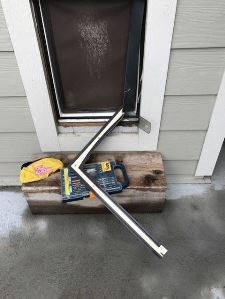 My husband and I are very satisfied with the Dog Door and it truly pays to have someone install…we don’t have the tools to do it ourselves. The contractor who installed was impressed with the quality. Our Tibetan Terrier is use to a dog door and she should be able to adjust in a few days to the new one! Freedom Pet makes a quality product. Is it expensive? Yes. Is this the best pet door on the market? Hands down, yes! If you are buying a new door, Lowe's or Home Depot can special order the door with the hole for the doggie door. You will just need to give them the cut specs, which are enclosed with the door and listed on their website. Great door, however there are issues. I waited to review this till I had it in for at least one season. The concept is great. Works as intended. Just a couple things I would improve. The stiching. It is raveling all the way around the perimeter, and I feel like I am always removing loose threads. The material does not retard mold. The door flap gets wet all the time, and mold has appeared on the flap, and I am unable to remove the stain by washing it. Also beware if you live in the midwest. When it is really cold out, there is tons of condensation on the inside of the flap. It freezes shut, and then during the day as the dogs use it, ice builds up on the magnets at the bottom, and the door wont shut completely. At night the cold air blows in, and makes it even worse. I use a space heater blowing directly at the door to warm it up and get rid of the ice. Trying to break the ice off would damage the magnets I think. Even with all these issues, I still think this is the best door option out there, just beware there are things to consider. Stitching - What the reviewer is seeing isn't stitching, but loose reinforcing nylon fibers in the flap seal material. The ends can be exposed in the die-cutting process. We burn the edges to melt them, but they can some times pull and look fuzzy. This is aesthetic only, and can be fixed by melting with a match or lighter. Mold - We do not put any anti-mold chemicals in our product for pet health reasons. The door itself won't support mold growth, but things like dirt and doggie slobber can. We recommend cleaning the flap with a mild detergent solution occasionally to keep the door looking nice. Condensation - This is not normal performance, and it should be fixed. The magnetic seal is somehow being interrupted. If the environment is dirty enough to experience mold growth, it is likely that dirt or other foreign material has gotten in the way of the DoubleMag seal. This is a rare occurrence, and likely due to the exceptionally dirty environment discussed earlier. 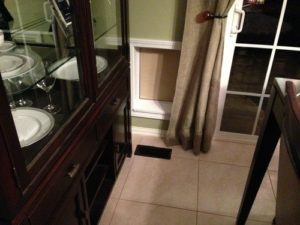 This warrants more frequent cleanings; while most doors might need to be cleaned only once every few years, this might need it once or twice a year. It's been a couple weeks since my large size door has been installed and it's great! Once the hole in the door was made installation of the doggy door was super easy. Incredibly high quality and completely weather proof. I live in snowy Canada and I have no air or snow coming through at all. At my surprise, my 8 lbs Pom learned how to use the door immediately! And it took my Border Collie about a week to get it...took more training and he followed his brother through the door for a while until he realized that he could push in the door himself...but he finally got it and now both of them are using it as needed. It has given me and them more freedom and I don't feel like I have to rush home immediately after work anymore to let them out. It was worth the extra money. I attached a few pics...not the best..hard to take action photos but it gives an idea. Btw your customer service is also great! Buy this door! Definitely worth the money! We replaced our leaky pet door that was installed in a door. 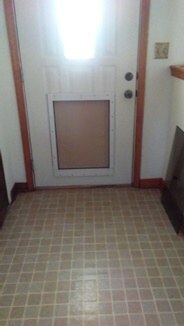 This pet door was easy to install, and the difference in our house was immediately noticeable. This door provides a tight seal. The panel that shuts the door is also easy to put in and take off, and the dogs can't knock it off. We're even thinking about installing one between the garage and outdoors, too! This is our second Freedom Pet Pass doggie door. We moved and we liked it so much we got one for this house as well. The pictures are of the pet door we had at the other house. We just picked up our new one and have yet to install it. But we are looking forward to not having to open and close the front door 38 times a day, especially when it is freezing cold outside. We live in Canada but are 4 minutes from the WA border, so when we order online we just use the address of the little store just across the line and then go pick it up for a small fee. After picking up the package I went through the border crossing heading back home to Canada. The border guard was surprised by the amount of over $300 (we pay more for exchange on the dollar) for a doggy door. I got called into the office and had to pay $43 Canadian duty since it was over limit for the amount of time spent in US. So that shows how much it is worth it for us to have this brand of doggy door. This is our second door from your company. We had a smaller one for our boxers but now we have two Mastiffs so we needed a larger door. Best dog door on the market!!! It’s been a while since I received the door and installed it, and thought you might like an update. My dog (Mojo) loves the door! Took her a while to get used to using it without asking for permission (we had trained her to “ask” (wait) before going thru a doorway) but she’s fully autonomous now. We love the door! As energy efficient as promised; great design that optimizes all the criteria of quality and sturdy construction, size, ease of use, security, safety, energy, easy to clean. And the plastic panel is a great feature. I added 2 wooden stops at the top, flush with the outer edge of the rabbet, to make installing the plastic panel much easier. You might consider adding this to the design. Thanks again for a great product, and for working with me to get the door I needed. I can't say enough about this product! It's amazing! We've had it for 3 years, and other than some dirt on the door, it's still working just like it did on day one. We've never had the door blow open, and it's facing directly into the direction of the prevailing wind. Our large dog has no issues using the door. I can't recommend this product enough. This door is the best one I have ever found! The swing panel closes tight to keep out winter air. I'm sooooo happy! I wanted to write a raving review for your product. We bought the Freedom Pet Pass wall mounted door this past September. My husband installed it right before winter hit us here in Lethbridge, Alberta Canada. Today, December 17, 2016, was the last day of a Polar Arctic Vortex that hit us over 3 weeks ago. Temperatures were -25 to -54 degrees Celsius (with wind chill), 24 hours a day. I have to tell you, the Freedom Pet Pass door did not let in any noticeable cold air! Nor was it cold at all to stand next to. We have been amazed and would recommend this door to anyone! Works for dogs and pig! Quite a few months ago I purchased a freedom pet pass cat door. I just wanted you to know how pleased I am with it. English autumns aren't the warmest or the driest but I've had no problems with draughts or water ingress, I couldn't have asked for a better cat door! I have two high energy Chocolate Labradors - Faye and Allie. My family refers to them as "the horses." 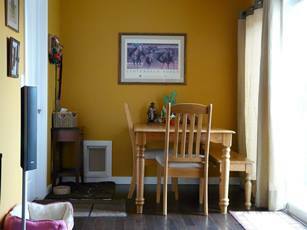 The Freedom Pet Pass in-wall dog door has truly been a life-saver for me over the years. I installed my first door in 2013 and moved from that house in 2016. In over 3 years of daily use the door never had any issues - even when the two "horses" tried to pass through at the same time! It always kept the wet weather and hot air (we are in TX) out while giving the dogs the freedom to come and go. When I sold my old house, I loved having the ability to replace the leather flap. Although the flap still worked perfectly, I wanted a "new" look on the dog door to match the painting and remodeling I did getting the house ready to sell. The house sold the first day it was listed, and the buyers loved the dog door themselves. If anything, it added resale value to my home. I'm now installing my second Freedom Pet Pass and my dogs, having been in an apartment for 6 months, are very excited to have their freedom back... as am I. It's so nice not to have to wake up in the middle of the night to let the dogs out. I also love the ability to "close-off" the door with the locking barrier. When I want the dogs to stay inside, I just drop-in the barrier and its sorted. We purchased your cat flap as we have our back door facing south west. It is exposed and we are very close to the sea. Even expensive cat flaps would not stop the ingress of rainwater or draughts. I purchased and fitted your standard cat flap some years ago and it is working well despite the fact that our cats insist on clawing the door open towards them and then squeeze underneath. Recently we have acquired a small dog which also uses the cat flap. I suggest you consider marketing your product more in the UK as there is no comparable product available here. This is solid and seems like it will keep the cold out. Worth the extra money if you have cold winters! We are getting ready for winter seeing that we just had our first snow of the season. I really wanted to let you how great of a product you have with the dog door. It is almost 5 years with only some cleaning and it still works great! Might need to do some flap replacement in the future, but I am so impressed with the quality of the product. No UV damage or cold weather damage on the flaps. The magnets are starting to show cracking and delamination but that is to be expected! Your door is how American Made products should be made, To Last! Would purchase again without question, but it is lasting so well that wont be a option! Thanks again for the great product!! Attached are some current photos after cleaning! The door is working very well (purchased April 2015). Windy summer with 115 degree heat - and it held up nicely. The door has been a great product. I had a Freedom Pet Pass door installed in our last house in the door, but when we moved to a new house we decided to place one in the wall instead. We hired a handyman who recommended a different brand door. It was a disaster. The other brand had a tunnel that looked cheap and when the wind blew the flap would fly open. When the door was fitted, the draughts disappeared which was amazing. However, the cats would not use the door. I have 4 cats, all Siamese and Orientals. They're an intelligent breed, so I wrongly assumed they'd be fine with the new door. The 2 boys grasped it first, not because their intelligence is higher, lol, but they're taller/leggier so it was easier for them, plus they're bigger built than the girls and this new flap takes a bit of pressure to open in comparison to the useless cat door that was there before. In total it took 2 weeks to train all 4 of them to use the door. It was necessary to tie up the outer door for about 3 days, and towards the end I think they were having me on, playing at being helpless! The door has exceeded my expectations in terms of draught control and now the cats are using it just fine, everyone's happy. The door you supplied is going to make such a difference to the temperature in my kitchen during the colder months. I'm convinced my heating bills will be much less because of the airtight seal on your door. 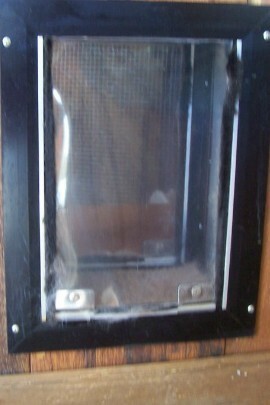 The construction of the Freedom Pet Pass cat door is excellent; it's extremely robust and aesthetically very pleasing. It did everything they said it would and my dog could not be happier with it also!!! Just want to say how great the dog doors are, I have a wall mounted one as well as the door mounted one and am super pleased with the construction and performance. 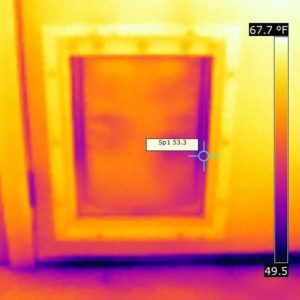 We had performance testing done on our house (blower door, etc) and the IR imaging done as the blower door was running showed no leakage from the dog door - very impressive under 50 Pa depressurization. Attached is a recent pic of the dogs...they are not near a dog door though! Can't speak highly enough about these doors...I've got two and wouldn't be without. My oldest door has been exposed to the harshest South Texas weather for almost 5 years. It's never blown open and still looks brand new. They are a bit pricy but worth every penny - I'll never look for another brand dog door and that's assuming I ever need another one. I've had two interactions with Freedom Pet Pass customer service, and they've both been great. Just recently, I lost my locking pin during our latest move... one of the perils of having a bunch of helpers pack the house. The folks at Freedom Pet Pass sent me another one at no charge. I also spoke to a representative several years ago when I thought the door was broken, and they took good care of me then too teaching me about how to easily fix the friction hold vs selling me a new flap I didn't need. I can't speak highly enough about the door, the quality, or the customer service. Love our door and tell everyone about it. I'm an Air Force pilot and we have guys moving through all the time. I think I'm responsible for selling about 15 doors. It is extremely energy efficient. However, if you have a small dog that is used to a door that doesn't have such a strong magnet or a door that is see-through, it will take some time and TLC for them to get used to it. WOW - Best pet door I have ever seen! $379 is a LOT for me to spend, especially on a dog door. But, I have never seen a better designed or well made dog door! I originally purchased it not for it's energy efficiency, but to keep some new kittens from going outside. Two of my 6 cats have figured out how to use it, so it can't quite make that claim, but it isn't super easy for them. Living in Arizona, the seal on this door is great and keeps out lizards, scorpions, and other critters, along with the dust and heat. I'm appreciating that more now that I have this pet door. When I first received the door I was concerned about the frame getting wet from my dogs when they go in the pool. I sent an email asking if I could seal it in some way. I QUICKLY, on a weekend, received a response from the company/owner telling me I didn't have to worry, "Everything on the door is completely weatherproof. The frame, which you were asking about, isn't MDF. It's a material called cellular PVC." They even thought of that! I installed the door using an inexpensive angle grinder I had because I didn't want to take the door off it's hinges. It worked great! You need to cut one side then the other. (Wear eye protection! Measure twice, cut once!) I did a better job than the "pro" I hired the last time. This 55 year old woman found it was much easier than I thought it would be. I did have a mishap with my dogs pulling out the outer flap. Again, I contacted the company and they were so nice about it and sent me out new flap that was stiffened for use with my dogs. I found that this door is so well designed that the door doesn't really get ruined and flaps are easily put back into place by loosening a couple screws. The only thing I would like was the ability to lock the dogs outside, but this is not a big issue at all. I can just hang something on the outside of the door. 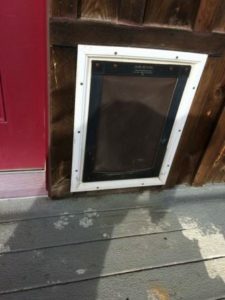 Take it from someone with 4 dogs and 6 cats - this dog door beats those plastic ones BY FAR! The company is responsive and fantastic to deal with! I had gone through at least 5 flaps on my old doors and they never sealed well to begin with. After a couple weeks they'd be stretched, warped and leaky. I fully expect this one to actually cost less in the long run because of how well it is made! 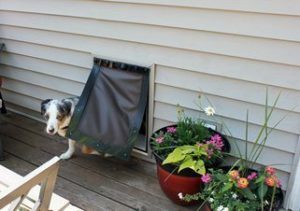 This dog door is a quality product, made in the USA, ingenious design by a company that TRULY PROVIDES CUSTOMER SERVICE! Well worth the price considering your cutting a big hole in your door! Now if someone would design me a vacuum cleaner I'd be complete! Best energy efficient seal on a dog door ever! Best dog door I have ever had! I have had dog doors for many generations of golden retrievers, and they have all been terrible at keeping an energy tight seal. I used be able to feel outside air (cold in winter and hot in summer) leaking into my house. This door flap keeps a nice firm seal. It took my more timid dog a few tries to figure out she needed to "push" the flap a little more than the old flimsy flap to get in and out, but a few tries with cookie rewards and she had the hang of it!! I highly recommend this product. It is a wonderful replacement for the 30 year old existing pet door! My handyman was quite impressed! Performance is excellent! Thanks so much for producing a quality product and being so helpful through the process! Great product - definitely weatherproof which is what we got it for. However (and this is a consideration for people with smaller or mobility-limited dogs), the flap from the outside is designed in such a way that the dogs have to step about an inch higher to get in, than they do to get out. This is hard on my older dog with arthritis and I had to get a ramp. We also have an accessory for door-mounted doors called the Pet Step that can help for situations like this. Have had the door 6 months now and still closes like it was new. Recently moved from a very warm climate to a much cooler climate. Needed to custom order a new back door and have a doggy door installed. No way I was going to go on the cheap. Bought this one direct from the manufacture and had it installed by a local door and window installation company. The door is fantastic! Very energy efficient. No air gaps, flap seals tight and is very durable. It looks a bit "industrial", but only because it is so solidly made. There are only two "gotchas" I can think of with this door. First, one of our dogs is quite small (an 8lb Yorkie) so I decided to go for the small door to accommodate him. It took him about a week to start going in and out himself because the door was a bit heavy for him to open. What ended up helping was putting a mat at the bottom of the door on both sides so he could get proper traction for pushing through. The other gotcha is that the door seals so well, that it is pretty loud when our dogs use it. It pretty much "slams" shut, so take this into account when you consider the placement. You won't want it near a bedroom, for example. But as far as what it is, this is the best possible quality dog door available. The extra money is well worth it, especially in places that have a cool climate. We LOVE our Freedom Pet Pass! I was a little hesitant to purchase the Freedom Pet Pass because the installation was a bit beyond my handyman skills. We had a contractor friend do the installation and we couldn't be happier! Our sweet Mini Aussie Shepherd has figured out the door in a few days' time and is no longer trapped in the house until our daughter gets home from school. The door's build quality is top notch and I'm super impressed with the ingenious magnetic seal all the way around the door. We've had some very windy days this spring and the door is simply airtight. I'm very happy we went with your product, thank you! I have finally finished trimming out our dog door and it looks awesome! Attached are some pictures of our dog Maddie and your wonderful door. If she could speak I'm sure she would thank us for giving her the freedom to go outside whenever she wants or needs. Again I have to compliment you on the build quality and materials you used to make this door. It closes quite solidly and is impressively airtight. After researching other doors and viewing videos of them in use, your door is obviously superior in both design and construction. Installed today and my doggy loves her new freedom! Contractor was happy with the results and I am too! We were able to install where I wanted it to be which was a win win situation, and not have to build an external ramp for her outside. My daughter and her husband have this same door in their house so I knew that we would be pleased with your product. Thank you, Glenda & Lilly? It works well for Mr pooch. I would like to thank you for the dog door which we received a while back, as you suggested we needed to add an additional strip to pack it out slightly due to the door's thickness (30mm) which is the standard panel for a UPVC door panel. The dogs have taken to using it very well, I didn't think they would as the old one was a clear plastic panel which they could see through and the magnets were failing so there was no effort involved in getting in and out. I had my reservations as to how they would adapt but it only took 2 days. One dog would go out but wouldn't come back in!! Thank you again for a brilliant product, the house is so much warmer and to my surprise a lot quieter too. This is a doggie door that is unsurpassed by any other brand. I have owned two other dog doors by two different companies, the kinds that are sold in chain pet stores or the big box stores. Both leaked air from day one (or at least within a few weeks). Yes, this is expensive comparatively but if you live in colder climes, you have to keep down on loss of warm air. This door does not lose warm air (other than by convection similar to windows and walls). I suppose if you live in a very warm climate, this door might not save you that much energy costs. But, it is more than a energy saver. The door is great but it was to heavy for my Chihuahua's and kitten to push through. I had to remove the part that actually seals the door air tight. Kinda defeats the purpose of the extra cost. Contact us for training tips with especially reserved dogs. Unless a dog has a physical disability, there's no reason that even very small dogs can't use our doors. We purchased the door for our beagle. We installed it into a window. It took some coaching to get her use to it. But now, she goes in and out with ease. During storm Jonah (Jan 2016) we got about 30 inches of snow but none came into the house. We also have had winds of about 20 mph and the flap stays secured. Great door and I'm very pleased. It's awesome! Money well spent! It's awesome! Money well spent! Our Golden Retriever took right to it. It always closes just fine, hoping it will stay that way for many years to come! Waste of money, does not work as advertised. Absolute garbage. Would have given 0 stars if there was an option. Bought this 3 mo ago as an upgrade from and IdealPet door. The house has a large porch and it is in the Arizona desert. We get storms during the summer and the winds can be strong but nothing like a tornado or a hurricane. The flap on the door does not stay shut as advertised but rather blows right open. Moreover, the quality of the materials used on this door is pure garbage. The concept is good and it is made in the US but it's not made right. For the money, this is unacceptable. To top it off, it is very ugly. Mercedes price and 80's Hyundai quality. The company's customer service is a joke. They are arrogant and do not go the extra mile to cater to the customer. Replacement parts for the door are very expensive and they do not last. We have 4 dogs, the door already looks like it's been there years and not just a few months. 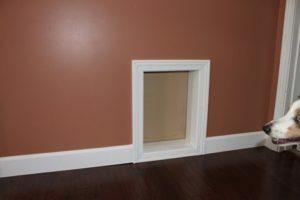 Will replace the back door to the house this pretend dog door was installed into and revert back to the IdealPet door. Please do not waste your money on this product. Best Pet Door Period. Nothing else even comes close. End of Conversation. Buy this pet door and you will not regret it. 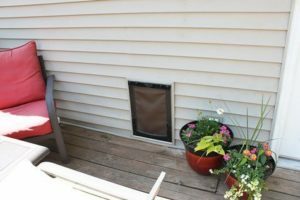 Prior to getting this pet door, we went to the big box pet store and purchased a Pet Safe Brand doggy door. We had several of the years because there's was always one thing or another breaking off coming loose and the dogs would chew the flaps as well. We replaced the flaps at least 5-6 times a year. At $25 a pop that adds up quick. Not to mention that these are so cheaply made even when performing correctly you still get drafts and lose tons of energy. This energy efficient pet door should be the first and last place you look. Don't think your saving money by buying the cheap one. You'll end up paying much much more in replacement costs and lost energy in your home. Yes it's a little expensive, but it's worth it. Seriously one of the best purchases we've ever made. Do yourself a favor and learn from our mistakes and do it right the first time with this amazing pet door. My dog hasn't gotten the hang of using on her own yet, but we're working on it. I live in Alaska and it's been the best sever-weather dog door I've found. With magnetic contact on 3-sides I can't imagine this door not sealing properly. Installation was easy and the secure locking door panel is a nice feature. It was more than I wanted to spend but I'm happy with the quality. My previous dog doors didn't close when the weather dropped below 0 because the plastic would stiffen and the magnets wouldn't catch. This thick canvas door and the magnet placement design solves that problem. Best dog door out there! Holds up really well! No drafts make it past this door, even in the 30 degree below zero winter nights at 10,000 feet in the Colorado Rockies! Get it! I have had the Pet Pass door for nearly 2 years and I couldn't be happier with it! It is truly air tight. It doesn't let in icy cold winter air OR blasting hot summer heat in Kansas. My big dog uses it many times a day, yet it is still in very good shape after all this time. I'm thrilled with my decision to buy this door! Thank you so much for making a product that truly fulfills the promises! Hey you dogs - You made the most amazing dog door. It's been installed in my kitchen door for about 3-months now and never blows open in the wind. I live in an extremely windy area outside of Flagstaff AZ and it has passed (stayed closed) through 50mph winds! House may creak in the wind by the dog door stays securely shut. Thank you for making the most amazing and functional door. All 12-paws are very happy! Great dog door. Seals completely. Best Pet Door EVER. I bought this door in the summer and wanted to wait until winter was upon us to write an accurate review. We live in Upstate NY and to say this winter has been bitterly cold is an understatement. 24 of the 28 days in February were below freezing (most days being in the single digits) and very windy and snowy as well. To say this door performed as described is an understatement. During all of the storms we endured, this door never moved once unless one of the dogs was going thru it. Not even a little bit. We have 2 labs and a small terrier and it's not a problem for any of them to navigate through the flap. Wish I had invested in this door years ago. Worth every penny. I bought this to replace another expensive dog door that had been in for over 15 years. I had built an addition and put that door in and for 15 years I had a drafty house. Figured, "that's it, that's just the way dog doors are," because I had spent so much money on that door, it had to be a good one, right? Well, it was a good for the first few years, but it always leaked air, even with occasional replacement parts installed. Anyway, after last winter which was a tough one here in Northern NYS, it was obvious the old door wasn't doing the job, so this winter I bought the Pet Pass door off of their website (free shipping that way) and installed it a week ago. Wow. What a difference. The draft that I ALWAYS had felt was gone, just like that. It has really made a difference in comfort of the house. I had a contractor install it since it was taller and wider than my old door, but it was an easy job for him. The only problem with the door was the flap was slightly crooked (very slightly) and I had to trim one edge for it to work freely. I believe it came that way, but since the flap is replaceable, I figure if I wanted to I could have taken it apart to let it hang perfectly. But, hey, it was windy and snowing and I just wanted to start using the door! It wasn't a big deal, in any case, but it might be something to check on before you install yours just so you can make sure yours hangs correctly, or else be aware that something to do with the installation may have pinched something. I know mine was installed perfectly level, but I don't know if the contractor may have done something else that would cause this to happen. It is a noisier door than the old one it replaces, but not enough to be a problem, and you do get used to different sounds in your house. Due to the design of this door, btw, you can tell by the sound whether your dog is going in or going out if you can't see the door where you are. As to the dogs, I have two German Shepherds and a Yellow Lab and they all have had access to a dog door their entire lives and go in and out easily dozens of times a day. The year old GSD pup picked it up right away. He was using the new door before the installer even left. The 10 year old GSD was not far behind him, using it without problems in an hour or so. My Yellow Lab was the hold out, taking about three days before she was comfortable using it. She mainly didn't want to press that hard on the door to get out, since the old door would open easily (and could be seen through, as well). This shows how strong the seal is on the door. BTW, this new door is tall enough for my tallest GSD, if anyone is wondering on door size. Both GSDs of mine had always had to duck their backs to go through the old door. The top of the flap on this door is at 29" from the floor and it's a good height for this breed of dog. It's 3" taller than the old door and the old door rough opening dictated the bottom height of the door. For those with small dogs, the instructions tell how to lessen the magnetic hold so it's easier for them to open the doors. They say that the door will still seal very well, however. If you have a mix of big dogs and small dogs or perhaps a cat, you might have to do it. So Jaco and Joni had been driving us crazy to go outside and we really are adamant that they can't be outdoor kitties because of the hawks and coyotes in the adjacent woods so we have taken to leaving them out on the screened porch which they love. 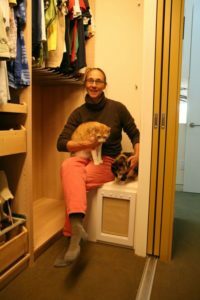 We have talked for a while about figuring out a way to put a cat door out to the porch but the porch is directly adjacent to a solid wall of kitchen cabinets. Just installed my door and really works and seals out wind as promised! Installation took approx 1 Hr. I researched all the doors on the market and chose this one and i am very glad i did. Energy efficient and tough as nails! Moved to Nebraska in 2008. House had existing dog door in garage wall as well as door to garage and interior kitchen door. Each one was aluminum frame with dilapidated plastic flaps. It was basically winter INSIDE the house. I bought the small Freedom Pet Pass wall mount door for the garage wall because it was the only product I could find to fit in the existing hole. It has had five winters use with two rambunctious Westies who each want to be the first one out. Other than having to wash the flaps and frame I have not needed to do a thing to the door. It never freezes open in the winter and it faces the bitter winds we get off the Rockies. Nothing has ever come loose, frayed, sagged,or bagged. The locking panel drops into place and locks with a pin, quite secure. At the time I thought the price was staggering but it really was a smart investment. Am seriously considering replacing current dog door in garage door with Freedom Pet Pass. Hello! The door was delivered in a timely manner and my neighbor, who is a handy-man, was able to install if for me in less than an hour! My beastie boyz love having their dog door back and the timing was perfect now that the weather is getting colder! We (Dogs) love the pet pass wall door. We ordinarily just have two Cocker Spaniels that use the door until recently. Our Border Collie had a front leg amputated is temporally indoors. She has no problem using the door that is actually a little too small for her. Amazing that she can learn so fast to walk on three legs and maneuver the pet door. A good testament for the ease of use for your door. Very durable, and wind and weather proof!! After scanning the web for quality doors I found and chose your product. So happy I did!!! Thanks for your prompt service. Lucy loves her new door!!! I painted the frame of the door to match the trim color of the house. There was a dog door in that wall before but it was damaged and the parts were not available to repair it. This door is much more weather tight. High quality and sturdy construction with a good seal. Although maybe a bit high in price, this product is what I expected. I ordered the large and mounted on the wall. If you plan on mounting yours on the wall, plan on spending $20-$50 on supplies to frame it in. All in all very satisfied with this purchase. could not be happier with this door. rugged and energy efficient, Had to retrain my smaller dog to use it, but it works great and has made a huge difference in my house. Looks good, works great - snaps back in place every time. I put it through a metal door and though the cut in the door is not pretty, you can't see it as the cover plate conceals it. I anticipate this lasting a long time. My old pet safe door is in the wall and the bolts have slowly worn out the drywall holes and is loose from constant use. The kitty is still inspecting it and insists that I open it for her, but once she has the need to get out quick for some reason, I know she will push her little face against this big old door and realize it opens just as easily as her little kitty doors. I highly recommend it. I think it is worth the price. I haven't had any tornadoes come through, maybe someday I will blow at it with the shop-vac blower just to prove it stays shut, but I am sure it will. This is a fantastic dog door. It seals tightly and is extremely energy efficient. My dog learned to use it quickly, and is more energy efficient than opening an actual door for your dog. The installation is not for novices. You will likely need to hire a contractor unless you are comfortable cutting through your wall and installing trim. I had to make cuts through our vinyl siding and learn how to install J channel around the door. I also had to install some blocking and build a tunnel though the wall. I then trimmed out the inside of the door to match the trim on other doors throughout the house. The installation ended up looking awesome and like it has always been a part of the house. I am extremely happy with this door and would highly recommend it to anyone looking to allow their pet the freedom to come and go as they please. The door itself is very nice.That being said, it is not set up to install. I had to adapt it and construct the framing. 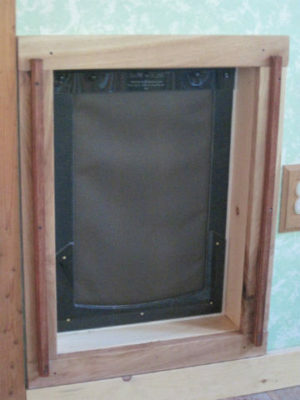 This also meant putting the pet door in so that the cover was not usable. n adapter kit and hardware would improve this product greatly. 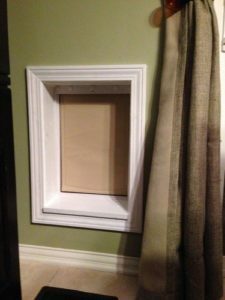 Freedom Pet Pass comments: One of the misconceptions that is rampant in the pet door industry is that it is acceptable to just punch a hole in the wall and throw in a pet door without proper framing. This is a very bad idea for any through-wall pet door, even if that's what other manufacturers have in their instructions. Proper rough opening framing with stud material should be a part of any wall-mounted dog door installation, just as it is for windows, doors, and skylights. Don't just take our word for it, check with any licensed contractor or your local building code. Regarding the security panel not being usable, Mr. Rice chose to install the pet door backwards for some reason (exterior side of pet door toward the interior of the house). This is not recommended or necessary. Consult our installation instruction videos for information for a code-compliant and energy-efficient door installation. Ingenious design, Works perfectly, Superior to every pet door I've ever owned. This is not the pet door that you are used to, it is far better. I purchased the wall mount unit and had to frame it in, cutting through cement board, tyvec, rewire an outlet to move the romex out of the way, and after all of that this was still worth every dollar. I will say that the instructions are a bit lacking, so if you don't have experience with framing in a window/ door you may want to hire someone to install this for you. ** A dual flap with magnets at the bottom and felt brushes on either side. all three leaked, with the electronic one being the worst... that's a whole other review. This door is airtight and well designed. The price may scare you off, but its worth every dollar. 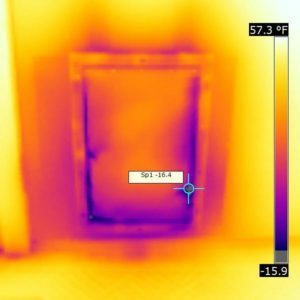 After installing the door this winter, the heat in my home ran less often and I have noticed a difference. like all pet doors, its a bit loud when it shuts, but in this case, that's the sound of savings. Dogs learn to use it almost immediately. just had to show them the new door and hold it open for them once. A tunnel for the wall mount would be a nice option. TL:DR: Best Pet door you can buy. Does not leak. Would absolutely buy another one. I recommend it to everyone. Hi, I just had to write to say how immensely pleased we are by the cat door you sold to us. We are in an exposed position on the coast where we receive lots of south westerly winds accompanied by rain. I have fitted several different cat flaps in the past but most of them were expensive rubbish. Either the cats broke them or the wind and rain came in and soaked the floor. Now I have fitted your cat door my kitchen is warmer and my oak floor is no longer being damaged by rain. We are really impressed by your product. I would strongly recommend that you market your product in the U.K.
We did the candle and leaf blower trick and it really works!! Great decision for us to upgrade and get this dog door! Thank you for making a great product. It's a little noisy when the dogs come through but, we're getting used to it and recognize that "snap back" noise is keeping the air conditioning in and the heat out so it's worth it!! 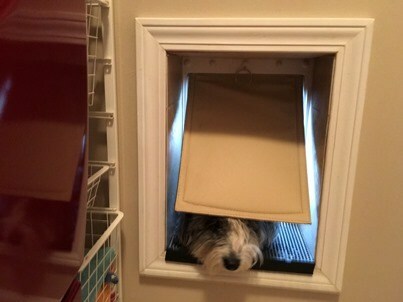 This dog door creates a tight seal that keeps the cold air out, just as advertised. Even during some crazy winds that would have had our old door flapping like crazy, this door didn't budge. Two cons: it's a bit noisy when it flaps shut and is a challenge for the cats to open, even when adjusted per instructions. Still totally worth it. This is the ultimate pet door and worth every cent. It's never opened under high winds or let in any rain or snow. It`s super easy to install and looks good. It`s the only door that should be considered and it will be the last you`ll need to install. Great work, guys and thanks a bunch. Hi, I purchased a door earlier this year based on the hope that it would hold up to the harsh Fairbanks winters. So far we have seen temperatures drop to -47 degrees Fahrenheit and there's no draft! A little frost forms from my dogs going in and out, but it is just amazing! A severe wind storm took out some trees in our yard and blew open an attic hatch that was NAILED in, but the darn dog door didn't budge. Thank you for making such a great product! 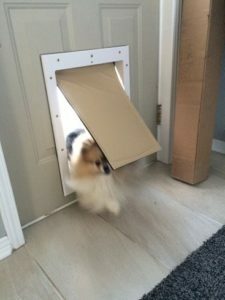 I had installed a much cheaper dog door a few months ago and while impressed with the installation instructions, I was disappointed in the construction and materials used. It is still in use today and seems to work ok. Definitely not energy efficient but then it goes from the garage to the outside. Needing a second (more enery efficient) door to go into the garage, I decided to give the Freedom Pet Pass a try. MUCH more expensive but definitely a better value with much heavier construction. This door does not 'flap in the wind' like the previous door (originally installed in the same door as the Freedom unit). I was surpised as to how little packaging was involved. Basically the unit was wrapped in bubble wrap and put in a shipping box. More than adequate but not all that 'professional'. Written instructions were vague but the web site has a number of installation videos that are very good. One tool that would make installation much cleaner is a good file (as shown in the video). I did not have one but wish I would have. One dog uses the door with no problem but a second dog is hesitant due to the weight of the flap. Slowly she is accepting it though. If you need a good energy efficient unit go for this one. Will it hold up to hurricane force winds? Dont know but I would have bigger problems if that happens. This is a fantastic door for the dogs. Gives them their freedom and keeps the cold out. When we go away, the security door assures us the house is safe! Dog door warmer than wall! Just wanted to drop a note to say we LOVE our Freedom Pet Pass door - we installed it in June 2011 and it is still going strong. Absolutely love it. We've actually got a piece of foamboard insulation that we put in the opening at night instead of the locking door, which makes it warmer than the wall it's in. Go figure. Thank you so much and best regards. I've owned this door for 4 years and can say with confidence that buying it was the correct choice. When you look at the different designs out there it's really the only reasonable choice if you care about energy efficiency. They have that video with the fan on the manufacturers website and I would say that it is every bit as air tight as they advertise. I have a jack russell and a 90 pound pit/boxer mix and they both barrel through it at top speed several times a day. It is showing signs of wear after 4 years of this, but over all it's held up pretty well. I've had to contact the manufacturer twice regarding issues with the door and both times they exceeded my expectations with their service. 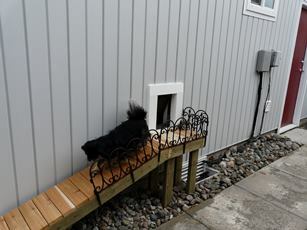 We installed this Freedom Pet Pass small dog wall door in early September 2012. It has worked very well for us and is everything the manufacturer claims. It really is air tight and closes securely every time. 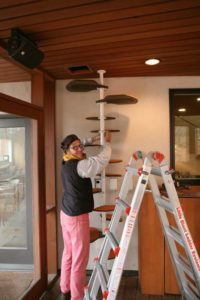 The design allows for a lot of installation flexibility so you can match your existing home interior and exterior. I decided to hire someone to install it. He took one look at the unit and said, "piece of cake". It took him less than two hours to cut the hole, frame, install, trim, and paint it. The door appears to be well designed and ruggedly built, especially compared to other dog doors I've seen. I have no trouble believing that it will last for years. It is wonderful that our dog can now go to the back yard whenever he wants without our having to either leave the back door open (not the most energy efficient or bug free option) or open and close the door for him. On the minus side, the door came with no instructions. (I'm not sure if that was a shipping issue or if they really don't ship with instructions.) The manufacturer's web site had minimal instructions. More detailed help can be found from customer reviews and tutorials. I printed out everything I could find for my installer. However, he only needed the installation dimensions. editor's note: since Mr. Altekruse's purchase, both our printed and online instructions have been significantly upgraded. There is one downside to this door's design. It takes about twice the effort for a pet to open the door when going outside than it does going inside. If you look at the outside picture of this door (included at this Amazon page at the time I submitted this review) you can see the tan door flap which swings both in and out. It looks like it has a black frame around it. Actually, that black frame is a second flap which only swings out. Its purpose is to prevent air and rain from getting through the sides of the tan flap and it does a very good job of this. However, when a pet goes out of the house he has to move both the tan flap and the black seal. This is a challenge for my small 12 pound dog. He has no problem coming into the house but he struggles going out. Our dog quickly learned to come into the house but it took us over a month to train him to go out. He apparently doesn't like to push the door open with his head. Instead, he paws at the door. When it opens he keeps pawing at it to keep it open but it usually takes him many tries before he succeeds. I've seen him take over a minute to get out of the house. Everything considered, we are very happy with this Freedom Pet Pass door. I chose this product because our old door alloowed too much heat and air conditioning loss. Door is very sturdy and well made. A little expensive when compared to a standard dog door but I think I'll recoup the money in utility savings. Once I installed this door, it took a few days for my dogs to get used to the fact that the door was not clear. Once they did, they had no issues using it. It has been very windy here in Dallas, and cold (for us). Even with that, I can stand next to the dog door and I can't even feel the cold. 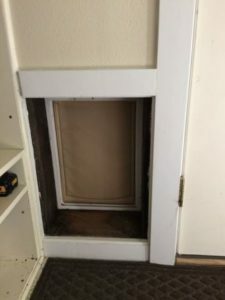 In the past, the old plastic dog door would get cold, it would harden, get stuck, and cold air would just pour in to my house, with this door, no longer! I highly recommend this door. I purchased your large wall mount pet door in October of this year. Got it installed in November. It is working really well. My German Shepherd, Lady Boo zooms in and out with no problem. Her goal in last few days is trying to bring a long tree branch into the house. Hopefully she won't figure it out! So far we have had some extreme weather, with the temp getting to as cold as -40 degrees Celsius for 2 or 3 days and nites in a row. I have not had any problems, just a small amount of frost forming on the bottom of the flap inside. I use a hair dryer to melt the frost, and clear up the moisture and fur with a paper towel. Haven't noticed any drafts. So far so good. I was wondering if you sold the flap separately? (Just in case this one should fail to function after normal wear and tear). I am just thinking ahead. Hi. We got our dog door. All I can say is just how much we love it. The other dog door made so much noise every time the dogs went in and out. Also, the area around the old dog door was really cold in the winter. I can only imagine how much heating and cooling we lost with the old door. I really wish I had found your dog door before I purchased what I was told was a dog door that sealed. The only thing that was a draw back but not really was the size of the door. It really was bigger than 11 by 17. We are fine with that just had to enlarge our opening a bit. Just want to tell you again how happy we found your website and found that door. Love, love, love it! Thank-you for getting it here so fast. Freedom Pet Pass note: the 11'' x 17'' measurement for our large is the pet opening, which is the smallest opening through which your pet goes. This is the important opening for determining which size your pet needs. The rough opening size, used for cutting the hole in your door or wall, is larger to accommodate the frame. So this dog door was an upgrade after our previous unit had about 5 years of wear on it. The old unit had a standard metal frame, and was a 'large breed' dog door. In MN, in our winters, it wouldn't be unusual to have ice forming on the interior of the old dog door, and water condensing/dripping onto the floor due to the temperature differences. The closet where the old door was located was significantly colder than the rest of the house. Today though was the last day of weather over 20 degrees before a weeks worth of near zero temps, so I decided to do the installation now rather than wait, and boy am I glad that I did. A huge reason this door works so much better than other models I've tried are due to the door materials used. The frame is some kind of low heat transfer material, and the door flaps (2) are both made of a thick material that has virtually no heat transfer. By having two flaps instead of the typical single flap, the flaps are able to seal with each other, ensuring an air tight seal every time. I had to reframe the top of the old opening, but the sides fit perfectly. Once framing and sealing the door with exterior caulk, I noticed a massive, immediate improvement in the temp in the room. I filled in the small gaps and we went out for dinner. Came back two hours later and the closet is noticeably warmer than it has been in the past. I wish I'd gotten this door years ago. The two dogs figured out the new door in about a minute. edit: I just wanted to update my post after going through the coldest months of a Minnesota winter. 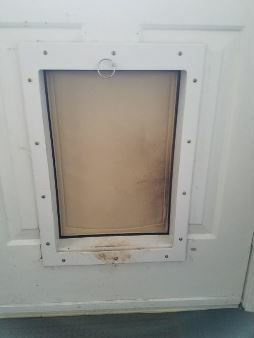 We had days where it was easily -20 F with 30+ MPH winds, and you couldn't even feel a whisper of outside air when standing next to this dog door. Unbelievable how much better this is than our other dog doors were. I'd thought perhaps with enough wind or when it got cold enough I'd start to find where this door no longer excels, but it hasn't happened yet. The only thing I can say that I might not like about this door is that the old dog doors had transparent flaps, and I liked that it let light into the room where the dog door was located. I wouldn't dream of trading that for no weather proofing though, but I had to come up with something about this product that wasn't perfect so I don't come off sounding like a shill. edit: Just updating. Two years later, still loving the door. We had a 10 year cold snap this year, and I happened to have a thermal gun handy. Will include a short video review, but the gist of it is the door temp was a solid 3º - 4º C (40ºF) , while outside the flap it was -26º C. (-15ºF) so a difference of over 50º. My old dog door would get moisture around it any time it was a few degrees below freezing, and ice inside when it was below 0º F, so this is a major improvement. This video contains shots from two different days. One day when it was -29ºC and one day where it was a more typical -10º C.
I live on Eastern Long Island where we had high winds due to Hurricane Sandy. I purchased a dog door from your company in August and had it installed into the side of my house. During the entire storm the door flap did not even shimmy in the slightest! I am so happy at the efficiency of this product and will highly recommend to anyone who has a pet. Thank you for a quality product as well as stellar customer service. Our handy guy came today and installed the door. We had a few issues structurally, but with our house, not the dog door. 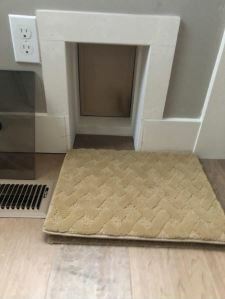 The dogs were used to having a dog door, so it will be an easy transition, although the fact that it's a bit harder for them to push open will just be something they will need to get used to. Our older dog definitely has it down and it's only been about 2 hours since our guy left. The younger dog will have it by tomorrow as long as he keeps watching the older dog. We were both remarking at what a difference it's already making in our walk out basement, no draft, and already a whole lot warmer! Thanks so much, we look forward to our dogs using it for years to come and for us staying warm! Dog Door Beats the Heat! I have been meaning to email you as we have had this awesome pet door in for a big part of our summer and love that it keeps out the heat. We have only noticed one problem and that is the boys, Einstein and Ziggy often enjoy just looking out it. Lol. Thank you so much for this door. Great weather proof door. Love it! We originally purchased this door for our home in Maine and are now using the same one in Colorado. 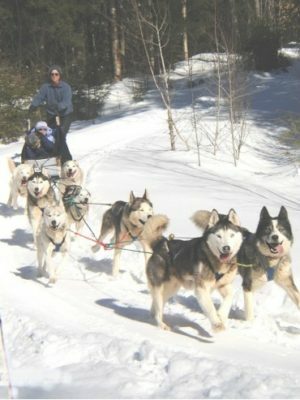 Our pair of Malamutes run in and out of this thing many, many times a day. 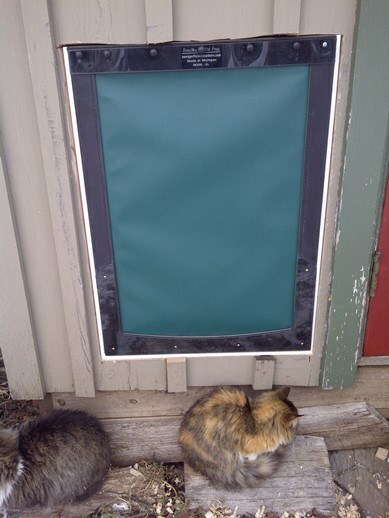 It's a sturdy, great quality pet door that does a fantastic job of keeping the weather outside. We've used other doors that you purchase at big box pet stores, but those weren't much better than a loose flap hanging in your door. This product, however, is absolutely worth the money. Their customer service is great, too. I had a minor issue with my door after my 85 lb Malamute stepped on the flap while it was open. I emailed Brian. 15 minutes later he emailed me back with his phone number. I had him on the phone and in minutes had my problem solved. If I ever need a second pet door, it'll be one of these. I was skeptical but now I don't know how I lived without it. I have two 5 yr old black labs and as active as they are this is a must, now they can just run outside whenever they want to. I also have one 12 yr old dog who has trouble walking and I didn't like holding the door open for her as she takes a minute to walk up 2 stairs to get inside (and in the winter I was letting a door full of heat out) but even she uses the door, this is a life-saver. ...that just confirms everything I've told everyone about Freedom Pet Pass and the company. We love your product and have always received excellent service. This just takes that service to another level. You guys are fantastic. We always make sure to spread the word about your doggy doors anytime we hear of someone looking into one or questioning one. We are convinced you make the best dog door out there and we can also say that you offer far superior service. We're sending some pictures of our project. 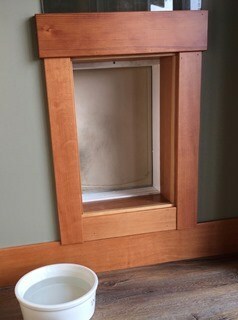 We tore out the old, leaky cat door and replaced it with a Freedom Pet Pass door. All this work for his majesty Williecat. He goes in and out and loves it! Thank you kids for a fine door and for making this cat one happy guy. The old door from the outside with brushes at the side and bottom that get full of hair. It is a double door setup with limited magnets at the corners that do nothing to keep the doors closed in high winds. 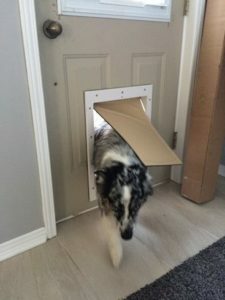 Last year I purchased the Large Locking Pet Pass Dog Door for the wall, and was really impressed with the attention I received that enabled me to make choices and have it sent to Australia. After xmas I managed to get some time and installed the door myself. To do it myself took overall about 1 week, but only 2 days to have the door installed and secure, the rest was to finish off, paint etc. What a great product, no more drafts coming into my home, my dogs quickly adapted and used the door and even better, this door my large Lab Trixie cannot crash her way through. Thanks again for your professionalism and assistance. Love the insulated cat flap! Writing this from Loveland Colorado! Want you to know that you have an excellent pet door. We have installed one at our house in town and it does NOT leak outside air. Fact of the matter is that the temperature on the room side is the same as the room be it winter or summer! We have NEVER found it other than perfectly closed and sealed. Our cat has made a game of going in and out. It is installed on the north side of the house which is the coldest side. We are planning on installing a second one at our mountain house on the west side, the side that the winds hit us on from the Big Thompson Canyon. We have absolute confidence in this product for that high wind application. We have hurricane force winds here in the Colorado mountains and have personally experienced over 100 mph winds. The old double flap cat door is not at all adequate and lacks the insulating properties of the Freedom Pass Door. When the wind storms come we stuff foam in the old door but when the new Freedom Pass Door goes in we can forget about having to do that! Freedom for us and freedom for the cat. So if you are considering purchasing this product just do it! It is quality through and through and is built to last and protect your home from heat, cold and wind. Thank you very much for nice product and service. The door is already installed and dog is using it right away. I purchased this door for my two 10-lbs Chihuahuas. I hired someone to install it, since I wanted it to go through the wall of our home onto the deck outside. I spoke with Brian at FreedomPetPass and he was very patient and answered all of my questions. After our phone call, I ordered the door and it was at my house three days later. Once it was installed, my two 10-pound Chihuahuas were a little skeptical at first, but within two days they seemed to warm up to it. They were already trained to use a doggy door, but the door they used was transparent, so I was a little concerned. I adjusted it to make it slightly easier for them to go in and out at first, but I put it back to full strength and they didn't even notice! They use their new door with no problem, and I am happy because the wind no longer blows the door open. What a wonderful product! Thank you so much. We moved to a new house and had to leave our old Freedom Pet Pass door there...I ordered another for the new house and finished the install today. Once again, thanks so much. Your dog doors are, hands down, the best made and the easiest to install. 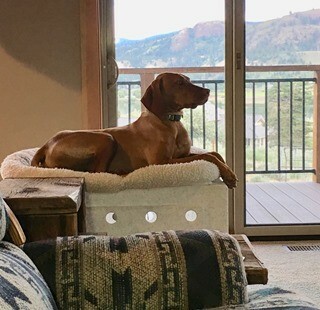 The one we left at the old house was as good as new (even though it was 3 or 4 years old) and had been used by 2 to 4 dogs for years (german shorthair pointers). This time the door is on the windward side of the house but having experience with your doors, I know it will not be affected by the wind and rain. I recommend your doors whenever possible. i know this seems like a ridiculous amount of money to spend on a dog door (and seriously, they are REAL PROUD of these things), but i am not kidding you, this is one of the best purchases i ever made. i have had it for almost 2 years now with my very energetic golden retriever and beagle, and it still looks and performs like brand new (needs to be wiped clean occasionally). it seals TIGHT... no air is getting past this thing. and even the hardest wind has never blown it open. the locking door is super easy to put on - you dont have to try to slide it perfectly straight into little side grooves. it's also relatively quiet. it "snaps" shut, but i've had doors in the past that would swing back and forth 4 or 5 times before finally settling into place. the only problem i've had is that it's not clear (see-through), so my dogs would stick their heads through it and just look around to see what's going on on the other side of the door... not very energy efficient when it's being held open by a dog's head! but with some training, they've learned pretty well to stop doing that. and i do worry a little about head-on collisions since they both run through it at 90 mph. if one of them is coming in and the other is going out (or standing there in front of it), someone is liable to get knocked out cold. Quick update: been almost 6 years and it still works perfectly. No leaks, never had to repair or replace any part of it. 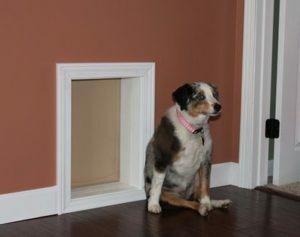 I am an energy auditor, so when I began searching for dog doors and eventually found this one, I was intrigued. Well, I did my research and finally bought it and am well impressed. True, it is a little tougher, initially, to push open but not too tough for my medium sized dog to manage. More importantly though, the air seal is fantastic. What a simple yet extremely clever solution to the eternal drafty pet door problem. I usually don’t write letters about products, but in this case I had to. I have had dog doors for 30 years and have never been so pleased with a product. I recently purchased your large door for my pack and I mean pack, German Shepherd, Rottweiler, Boxer, Labrador, and Boston Terrier. As I live in the country, in Alberta Canada, I have always had problems with weather as in wind and the bugs in the summer and cold as well as wind in the winter with all the previous doors. Not with this one. My husband has nicknamed the Freedom door, “Fort Knox”. It is absolutely air tight and looks great. I can’t say enough good things about it and is worth every penny. It is so nice to purchase an item online, get great customer service as well as the product as advertised. I‘ve recommended your door to everyone that I know who needs a pet door. Four generations of my family have endured jokes about the wind in the valley we call home. This winter has been especially blustery and drafts coming thhrough our old dog door could be felt two rooms away. I hated to spend so much on a new dog door from a manufacturer I had never heard of but the Freedom Pet Pass lives up to every claim on the website. It seals tightly and I have not seen or felt the wind open it yet our miniature schnauzer navigates through it with ease. It is a very well made product with a great design and is worth every penny. Finally our dog door is a match for the extra insulation, Energy Star Windows, compact fluorescent lighting and ground source heat pump we have installed to improve our energy efficiency. I recommend it without reservation. 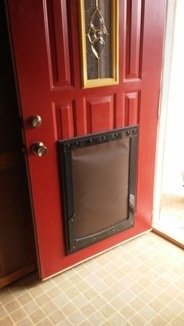 I wanted to share -- I love the pet door I ordered from Freedom Pet Pass. The door is so much better than the one I had before (2 see-thru flaps with magnets at the bottom). You advertisement is right on target - no wind or rain is coming in through your door! Thank you for such a wonderful product. I'm recommending it to several others I know who have thought about installing a dog door! Ok, here are the FLIR reports from your door and the PetSmart Winter grade door. This was a dual PetSmart door, one door in the main Door and one in the Larson storm Door. Your door replaced the original door and we removed the Larson Storm Door. The Mud room instantly increased in Temp and the drafts are now gone. If you look on the shot of your door the coldest part is now the door jam! Before on the PetSmart door, the Door Jam was warm compared to the dog Door! The Freedom Pass Door is X2 the size of the PetSmart door. Outstanding product!!! Feel free to use as you wish! editor's note: The temperature scales (color range) is different on each image because they were taken separately. The FLIR camera does a full color gradient over the range of temperatures it sees. Notice the lowest temp on the Pet Safe (dark violet / black) door is -16ºF, which is the cold air blowing in around the pet door. The coldest point on the Freedom Pet Pass picture (also represented by dark violet / black) is 49.5ºF, and that's where the human door seals against the threshold. The Freedom Pet Pass door itself (at the measured points) is actually almost 60º warmer than the Pet Safe door!